MONTREAL – Montreal Canadiens general manager Marc Bergevin announced Saturday that the team has agreed to terms on an eight-year contract extension with defenseman P.K. Subban (2014-15 to 2021-22). “We are very pleased to have reached a long term agreement with P.K. Subban. This agreement helps consolidate the future of our team. A key element of our group of young veterans, P.K. plays with a high level of intensity every time he steps onto the ice. Despite his young age, he carries a great deal of experience and brings contagious energy to the team. Defensemen of his level are a rare commodity in the NHL” said Canadiens general manager Marc Bergevin. Subban recorded 53 points (10 goals, 43 assists) in 2013-14, and was the only player on the Canadiens to suit up for all 82 regular season games. He led the team in assists (tied for fifth among defensemen in the NHL), powerplay points (23) and powerplay assists (19, tied with Andrei Markov). The 6’ and 217 lbs defenseman was second on the team for points (tied for fifth among NHL defensemen) and for time on ice (24:36). Subban was third on the Canadiens in penalty minutes (81), shots on goal (204) and bodychecks (135), while blocking 125 shots, the fourth highest total on the team. He also recorded four powerplay goals and one game-winning tally. 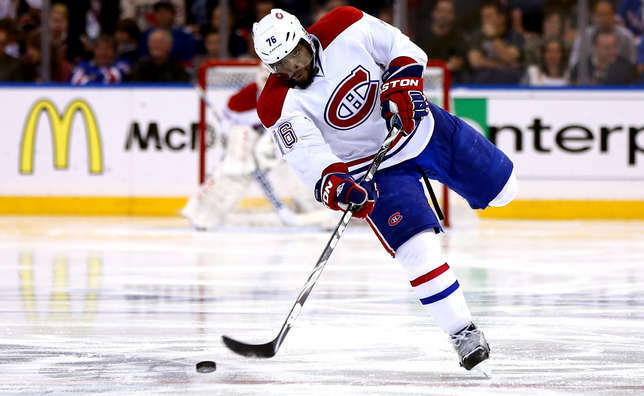 Subban, 25, led the team in the playoffs with 14 points (5 goals, 9 assists) in 17 games. He was a clear second in the league for most powerplay points (9), setting a team record for a defenseman in a single playoff year with four goal with a man advantage. Subban also added a game-winning goal along with a +1 plus-minus ratio and 24 penalty minutes. In 284 career regular season games since making his debuts with the Canadiens in 2009-10, Subban recorded 167 points (42 goals, 125 assists). He tallied 25 goals on the powerplay and had four game-winning goals. In post-season games, P.K. added 30 points (10 goals, 20 assists) in 43 playoff contests. A native of Toronto, Subban was selected in the second round by the Canadiens, 43rd overall, in the 2007 NHL Entry Draft. He represented Canada at the 2014 Olympic Winter Games in Sochi, Russia, winning a gold medal, and also at the World Hockey Championship in 2013 and the World junior Hockey Championships in 2008 and 2009 earning the gold medal on both occasions. In 2012-13, P.K. Subban became the first Canadiens defenseman to be awarded the James Norris Trophy since Chris Chelios back in 1988-89.